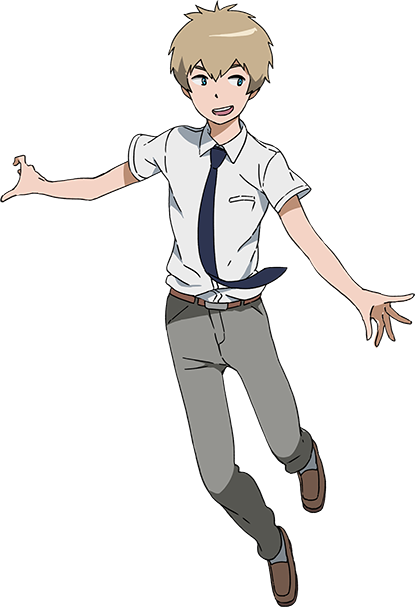 We can now confirm that Digimon Adventure tri. part 3 Confession will be released on September 24th. 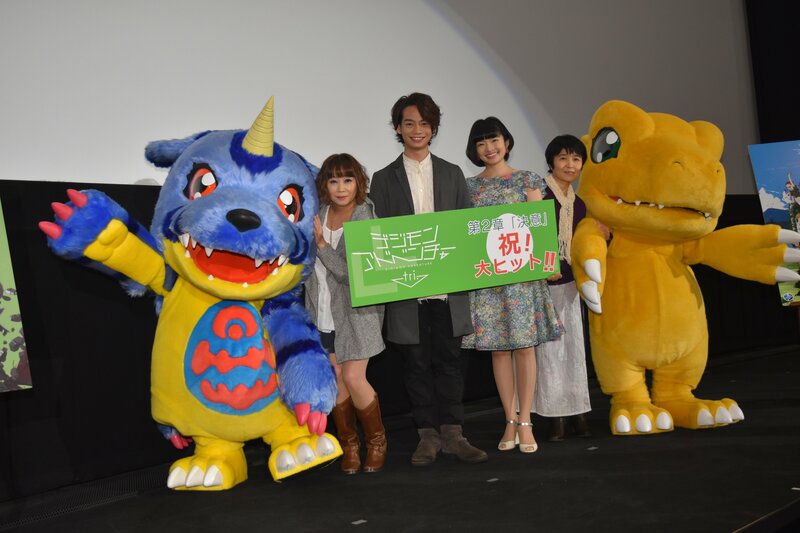 The source of the information is in fact Junya Ikeda (Jou), who was at a morning screening of Digimon Adventure tri. part 2 with Hitomi Yoshida (Mimi), Kinoko Yamada (Palmon), and Junko Takeuchi (Gomamon), as previously reported here. It was the first public screening of tri. part 2 with any of the cast present, at 8am at the Shinjuku Balto 9 theater. He also hinted that fans should expect tri. to get a bit sadder in part 3. Thus far the only solidly known detail known about tri. part 3, other than the title, is a small teaser they've stuck on the end of part 2 trailers, with Patamon saying goodbye to Takeru. Update- We have a LQ copy of the poster thanks to a Twitter user. 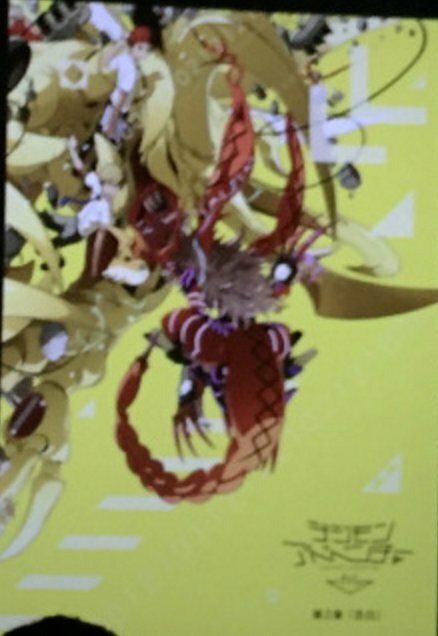 It shows Koushiro and HerculesKabuterimon, along with Takeru and Patamon (no Seraphimon on the poster, which is an interesting twist for the third poster) fighting what appears to be Meicoomon's evolution. And they've swapped the text and logo to black from white to make it more readable on the nice subtle yellow they are using. Edit- Some previous info from above that is rendered moot by confirmation from Ikeda. A handful of Japanese Twitter accounts have reported (with no sources) that we have a date for Digimon Adventure tri. part 3 Confession. Unfortunately, not only do they not give where they got the date from, they don't even agree on the date. Some are saying September 24th, others are saying September 29th. Has there been any word about there maybe being a poster at the theatre showing of Determination for Confession like there was for Determination at Reunion, I wonder? September is later than I had normally assumed, but it's actually extremely consistent. It was five months between Reunion and Determination, six for Determination and Confession. It was actually closer (ish) to 4 months. Late November for theatrical, Mid/Late December for home video of part 1. Early/Mid March for theatrical, Early April for home video of part 2. Ah, I thought that Reunion was released ten days earlier than it actually was, making it exactly five months because it's been so long. Silly me. If you are gonna have attitude, at least be correct. So as I said, closer to 4 months. Can we get back to tri. part 3 now? So I don't know if it was just people musing, but I've seen a handful of Japanese tweets saying the poster is yellow. Not really news since I think they are just contemplating it. I'm not sure yellow would work that well with the amount of background color these posters have had to be honest, or that they use a white logo and text... I think it'd just look overly blinding. Maybe if it were a duller yellow? Update- Weeee! LQ version of the poster in the news post now. They went with a more subtle yellow, and swapped the logo/text to black. Wow, that will be a long wait, especially after that cliffhanger ending. Weird, why is Patamon not evolved on that poster? Really looking forward for this movie, I have been since the first goodbye Takeru was shown on the forum. 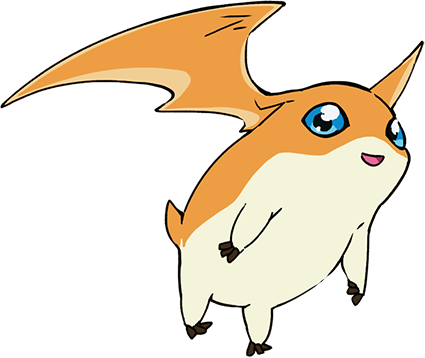 Looks like patamon/Takeru will play an important role (judging by the little we know) and Takeru is my favourite character. Totally agree the yellow background in the poster might be a bit to bright. It's obvious what is happening. The next two movies will only digivolve to mega Tentomon and Piyomon. Tailmon and Patamon's mega evolutions will be saved for a later movie which will be because they're the most powerful of the mega digimon of the chosen children. Plus Takeru and Hikari were always the last when it came to evolution. Quick question, how are they the most powerful?